If you've been dreaming of getting behind the wheel of your own Audi, the first step in making your dream a reality is to determine which of these superior models is the best choice for you. At Mohegan Lake Audi, our lineup of Audi models is truly remarkable, so we understand how challenging it can be to select the perfect fit. Fortunately, for drivers in Westchester County, your search for your dream car is made simple by visiting Mohegan Lakes Audi. 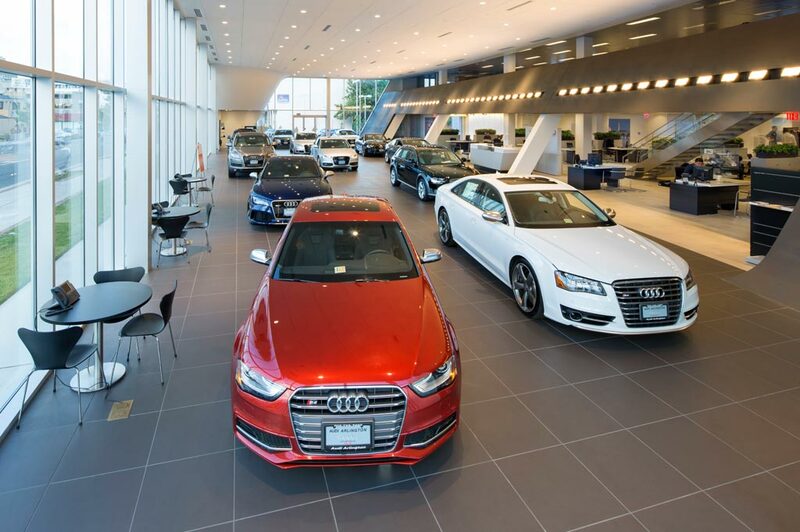 When you come to our dealership for your automotive needs you will find an unparalleled selection of new Audi models, so we're confident that a vehicle in our inventory will check off all the boxes on your wish list. To grasp a better understanding of what each of these models has to offer, we encourage customers to explore the information pages below. Within each of them, you will find vehicle specifications, photos, current incentives, and the available inventory of the specific model you are viewing. Peekskill residents that are looking for a stunningly sleek sedan will fall in love with our Audi A4 models. This luxury sedan has everything you could hope for, quick acceleration, superb handling, advanced technology, and high-end finishes. Even the standard features in the A4 such as leather upholstery with heated front seats, automatic xenon headlights, and a 7-inch media display allow for an exceptional driving experience. For drivers that need more space but still prefer the look and feel of a sedan, our collection of new A6 models will certainly impress. In the A6 you will still see the previously mentioned standard features and a powerful 2.0-liter turbocharged four-cylinder engine on the entry-level trim. If you prefer a compact crossover SUV to get around Ossining in, the Audi Q3 is worth a look. In the lineup of Audi crossovers, the Q3 is the smallest option, which is excellent for drivers that want the handling and capability of an SUV but love the ease of a compact ride. The midsize option for the Audi SUV lineup is the new Q5, with standard all-wheel drive, this is an excellent option for Westchester County drivers. All trim packages of the Q5 are equipped with automatic emergency braking for both vehicle and pedestrians up to 52 miles per hour. Not every driver is looking to get behind the wheel of a brand-new Audi, to accommodate these customers, Mohegan Lakes Audi proudly offers an inventory of used vehicles. When you purchase a used vehicle from our dealership, you can trust the car you're getting is high-quality and in excellent condition, because we thoroughly inspect each vehicle to ensure it will last for many miles to come. Purchasing a certified pre-owned Audi is an excellent way to get behind the wheel of a like-new ride at a competitive price. Each certified pre-owned Audi is guaranteed to have low mileage, no accident report, and is still covered by factory warranty. After you've had a chance to peruse our information pages, you'll likely have a better idea of which Audi model is right for you. The next step is taking one out for a spin, so please visit our showroom, and a member of our sales team would love to set you up in a test drive. When you're ready to commit to a new or used Audi, our finance professionals will then assist you in customizing a car loan or lease plan that works for you.